The basic equipment students need to start learning - all in one pack. A legal requirement for all pilots. This book records all of your flying activity from your first lesson through gaining your licence and all of your flying afterwards. Every training flight will be countersigned by your instructor. This is used as proof of your training when you apply for your licence and also of your ongoing flying to keep your licence current. 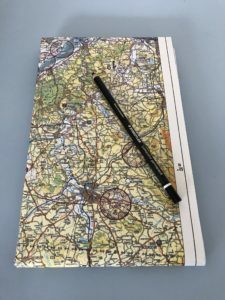 A specially produced map showing all of the airspace, land features and other flight related information for all of the South of England. This covers all of the area you will be training in and probably everywhere you will fly in your first year or so. Its a requirement, in law, that you carry a chart when you fly so this is your own copy to bring with you. This is the whole flying course laid out in simple, point by point, format. 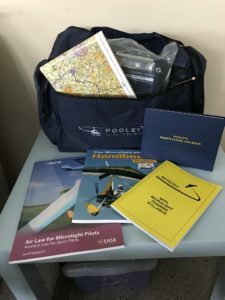 Everything you will cover during your flying training, including the five written exams, is explained in this booklet which is the framework we use for teaching you. Brian Cosgrove's excellent book is now in its 8th edition and is, basically, the definitive learning aid for this class of aircraft. The book covers all aspects, in detail, of the five written exams which you will take. It is easy reading and is well illustrated to make understanding simpler. Most of your lessons will begin with a briefing from your instructor. They are all described, in detail, in this book so you can get a jump start and read up on what's coming up before you arrive for the lesson. They also allow you to go back over anything that may have been unclear at the time - though we always encourage you to ask if there's anything you don't think you fully understand. This pack is included if you purchase the minimum 25 hours course.